Magnet Imprint: Price includes a 4-color process imprint on a white surface. 4-color process allows you to print as many different colors as you want for one price! All PMS colors will be converted to the closest 4-color process match. A perfect match cannot be guaranteed. Calendar cannot be custom imprinted. Please choose a stock background for the calendar. If not specified, the "Calendar" stock background (without lines) will be used. 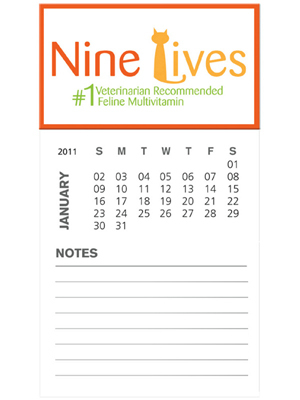 Orders placed after June 1, 2008 will have 2009 calendars attached unless otherwise specified. Magnet Imprint Area: For imprint areas and art template specifications, visit www.bicgraphic.com and click on Magnets. Personalization: Available for $2.00 per name, on magnet only. Shipping: Catalog quantities ship in 7-working-days. 2-day service at ground rates. BIC Air Express 1 Day Air. Since magnet products are heavy, please Click here for complete shipping information. Please specify the calendar stock background on your order.